Domville versus Oldys, in Error. E. I. 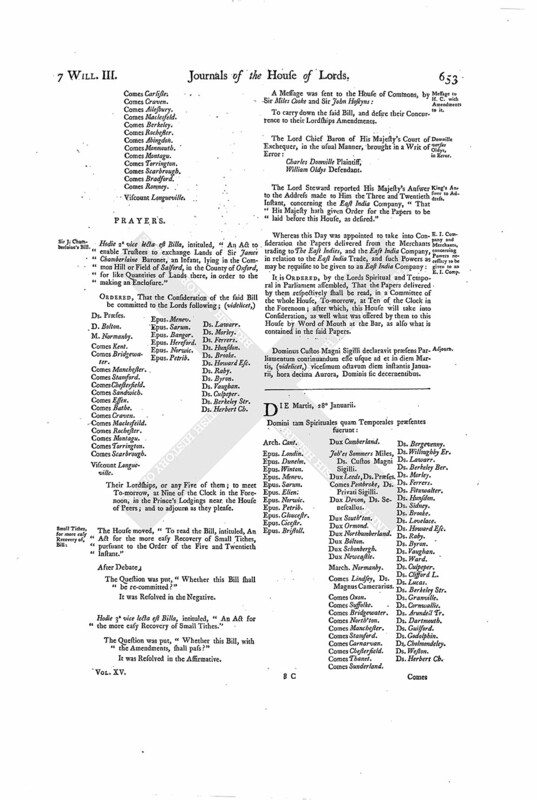 Company and Merchants, concerning Powers necessary to be given to an E. I. Comp. Joh'es Sommers Miles, Ds. Custos Magni Sigilli. 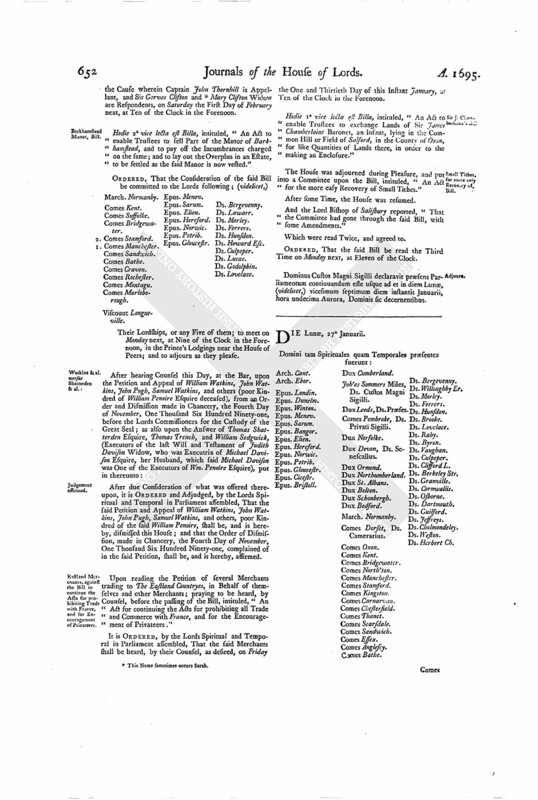 Hodie 2a vice lecta est Billa, intituled, "An Act to enable Trustees to exchange Lands of Sir James Chamberlaine Baronet, an Infant, lying in the Common Hill or Field of Salford, in the County of Oxford, for like Quantities of Lands there, in order to the making an Enclosure." Their Lordships, or any Five of them; to meet To-morrow, at Nine of the Clock in the Forenoon, in the Prince's Lodgings near the House of Peers; and to adjourn as they please. The House moved, "To read the Bill, intituled, An Act for the more easy Recovery of Small Tithes, pursuant to the Order of the Five and Twentieth Instant." The Question was put, "Whether this Bill shall be re-committed?" Hodie 3a vice lecta est Billa, intituled, "An Act for the more easy Recovery of Small Tithes." To carry down the said Bill, and desire their Concurrence to their Lordships Amendments. Charles Domville Plaintiff, William Oldys Defendant. The Lord Steward reported His Majesty's Answer to the Address made to Him the Three and Twentieth Instant, concerning the East India Company, "That His Majesty hath given Order for the Papers to be laid before this House, as desired." It is ORDERED, by the Lords Spiritual and Temporal in Parliament assembled, That the Papers delivered by them respectively shall be read, in a Committee of the whole House, To-morrow, at Ten of the Clock in the Forenoon; after which, this House will take into Consideration, as well what was offered by them to this House by Word of Mouth at the Bar, as also what is contained in the said Papers. Dominus Custos Magni Sigilli declaravit præsens Parliamentum continuandum esse usque ad et in diem Martis, (videlicet,) vicesimum octavum diem instantis Januarii, hora decima Aurora, Dominis sic decernentibus.